I’m so excited to share my DIY Reusable Dryer Sheets recipe with you today…you are going to love them! I’ve been making my own laundry detergent and other supplies for years now, but instead of using dryer sheets, I’ve been using dryer balls. Recently, I decided that I missed the smell and softness that dryer sheets bring, so I decided to make my own. I didn’t want to make them over and over again, so I made these DIY Reusable Dryer Sheets, and I love them! My laundry comes out smelling so good and with no static! You can make these in minutes and use them over and over again. 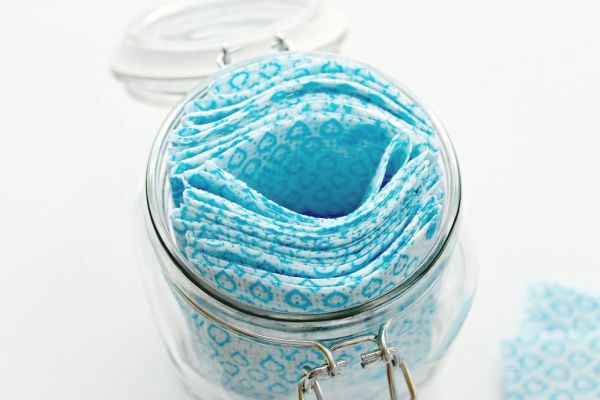 You will need an airtight container to store them in, multi-purpose reusable wipes, 1 cup of water and fabric softener. 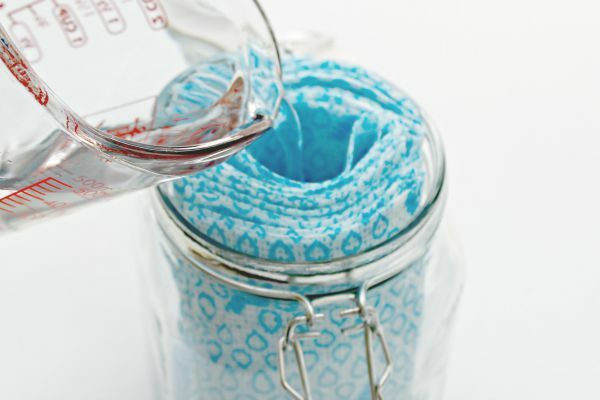 I am using my Homemade Fabric Softener to make my dryer sheets. My pack of reusable wipes came with six large wipes. I cut them into fours, which left me with 24 dryer sheets. I place them in my glass jar leaving a hole in the middle. 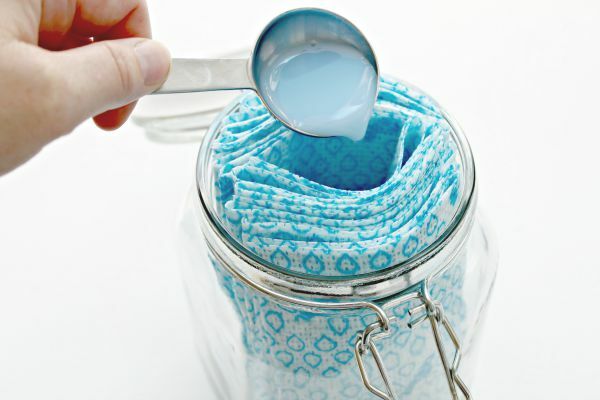 Next, I add three tablespoons of fabric softener to the middle. Now add one cup of water to the middle. To mix, close the lid and shake really well. The mixture will soak into the dryer sheets. To use them, simply throw one in your dryer with your clothes and turn your dryer on as usual. 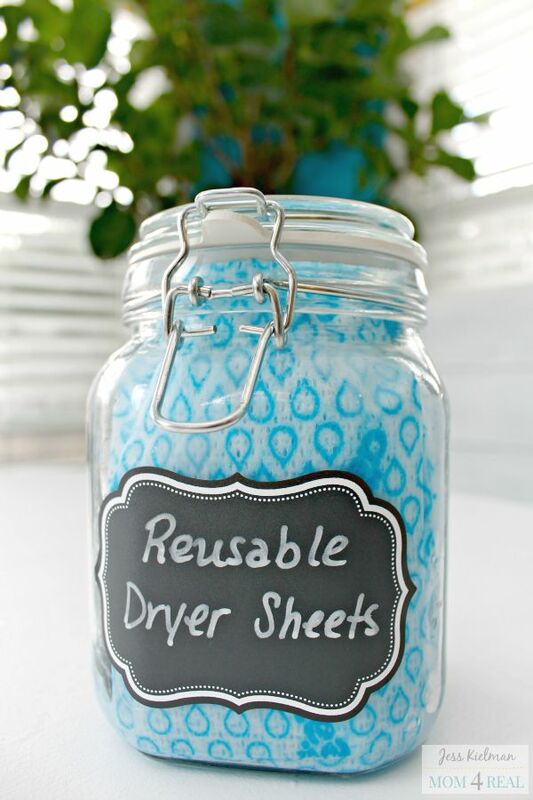 Once you use a dryer sheet a couple of times, you will want to set it aside until you have used them all. Once all of your dryer sheets have been used, you simply place them back in your airtight container and add fabric softener and water again. You will be able to use them over and over again! 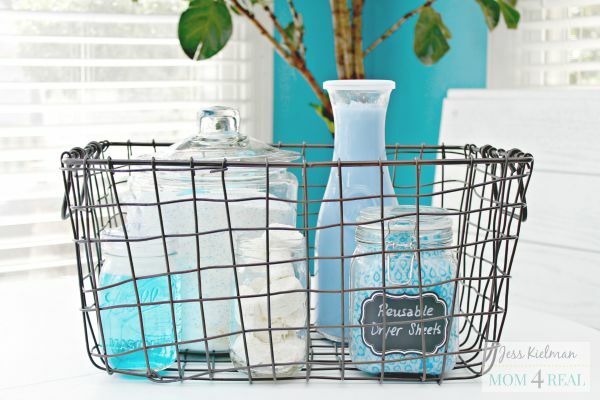 I love that this cuts down on waste and leaves my laundry feeling soft, smelling fresh and static free without tons of chemical! Win, win! 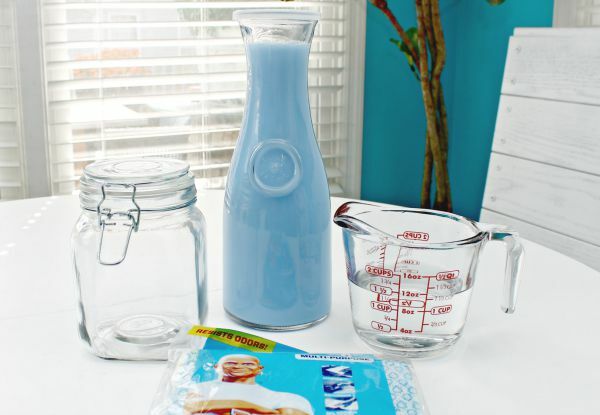 You can find the rest of my homemade laundry detergent, laundry tabs, stain remover and fabric softener along with tons of other cleaning tips and tricks HERE on my home tips page! « Meet Nash and Celebrate National Dog Week With Us!